Beyonce's giving us a refreshing peek into her journey of creating her love-it-or-hate-it album 4. She was ready to get back to the fun of it all. And she shows us what inspired her to do so in tonight's MTV/BET mini-documentary called "Year of 4." Mama Tina encouraged her to not let life pass her by. So after being exhausted after the last world tour and constant video and photoshoots and interviews and travel, Bey says she decided to take a year to herself just to do fun things she's always wanted to do. Like travel and spend time with family and friends. She spoke on leaving her only manager she's ever had--her father. And she revealed why saying, "a real change meant separating from him." She's managing her team of "people" and paid for her own studio time herself instead of going through her label. So the type of music she released is a result of her being free just to have fun. There's a clip of her working on the "Girls" choreography with Frank Gatson and the African dancers Tofu Tofu. There's also a clip of her doing her album cover photoshoots in her and Jay's penthouse suite in Paris. 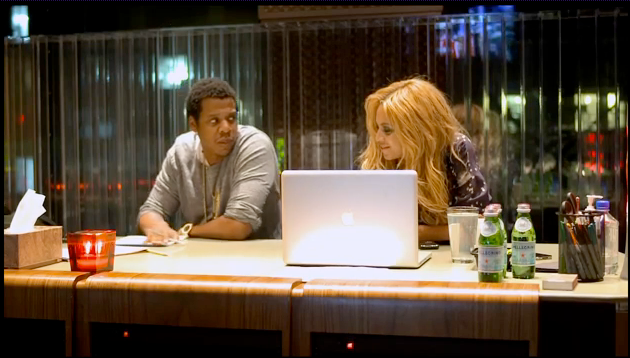 And we get an inside peek into how she tapped her hubby Jay, her cousin Angie, and her close friends to help her choose the 10-12 songs for the album. The album is fabulous! But this docu actually kinda bought me to tears. She's so humble, hard-working, and sweet. She definitely deserves all of the success she has gained thus far. She is AWESOME! Hands down! She is AWESOME! Hands down! FAB! Say what you want but the girl is bad! MICHAEL JACKSON BAD! Loved the docu...but, with all the $$ Bey has, did Tofu Tofu really have to fly Coach?? BTW - is she and jay in love? BTW - is she and jay in love? I think so, I think there is still some admiration there, but there are different levels of love. Every time we see them together they are not often holding hands or affectionate but I do beleive there is love there. It is not wrong, just different. She is definitely a performer, definitely. But the album is horrible. There are only 2 standout songs, not enough to justify buying the album. But yes, this woman can peform. Will she be a legend? i don't know. When I think legend, I think of Michael Jackson. To this day, I still have him down as the most talented singer/songwriter this world has ever seen. Don't believe me - go listen to Man in the Mirror..
My respect and love of Bey just brings me to tears! She is a QUEEN! I love her new album! Why people still continue to question the love that Jay Z and Beyonce have for each other is beyond me..It's really none of any one's business.. THANK U BEYONCE FOR SHARING YOUR JOURNEY WITH YOUR TRUE FANS AND FOR GIVING THE AFRICAN GUYS A WONDERFUL OPPORTUNITY ..!! LOVE YOU FOREVER!! I watched the doc on VH1. I loved it and love Bey. I loved the last one she did too and I think it had the same overall energy. It's to make someone who has become such a huge superstar seem more 'human' to the viewer, so you can relate again and therefore, buy her music. I've always thought she was a great performer, especially live. If you see her live, no matter what you think of her CDs, you will love her. It's worth your money. That woman performs! Like old school, dance, get sweaty, interact with audience and still sound good performance and I'm not a teenie bopper, I've been to some good shows! I couldn't help thinking that she acts like she's practicing medicine and not music. It's fascinating how seriously she takes the business and the art. I listened to the album snippets on iTunes and even though I bought and didn't love her last one, I'll be buying this one. About 50% of the songs were good on fist listen, which is good for me. Only complaint...too many ballads! I like when she turns it up! Lover her more and more every day!! Love the video so touching and inspirational.. Thanks YBF..!!!! Julius is taller than the door - LMAO!!! I love Bey! Beyoncé = An inspiration for women ! I just bought Bey's album and the album is on fire, I LOVE IT!!!! If you don't have it, go get it, her best work yet!!!!! You have to try Boj Oil.... It is absolutely the best moisturizer on the market! Boj Oil is 100% Organic Skin Food Oil that Moisturizes, Conditions and Protects YOUR SKIN. Last thoughout your day and Smells Great, without leaving you GREASY. Heals Ezcema, is instrumental for Diabetic skin and footcare and is safe for children. It's a No Brainer and ONLY $9.99!!!!!!!!!!!!!!!!! Just choose your fragrance@ www*thelanarienne*com OR google *Boj Oil* LOVE YA!!!! by Boj Oil " Better than Lotion"
Um they're called TOFO TOFO.... u busy thinkin' bout food, huh? THA QUEEN!!!! Haters gon hate cuz they cant be QUEEN Bey Bwahahahahahahahhahahahah.....go kill urselves!!! I THOUGHT IT WAS A VERY GOOD VIDEO...IT DOES SHOW HOW HARD SHE WORKS AND I CAN APPRECIATE THAT! Ok..so I watched her performance on the BET via satellite again and the song itself was HORRIBLE however; Beyonce is a performer and no matter how lousy a song the stage show will overshadow the music. Even Michael had a couple of lousy albums. She definitely has a long way to go but she is no MICHAEL JACKSON! There was only 1. Just like there will never be another Patty Labelle, Gladys Knight, Shaka Khan, Aretha Franklin...let the legends be legends. She definitely has made her mark in the industry and will continue to do so. Beyonce does not have any people around that can tell her the truth, you can tell everyone is afraid of her and Tina. Beyonce needs a best friend other than her husband. Like Oprah has Gayle. Don't get me wrong I mean a real friend not a jealous, envious, back stabbing, want to screw your man, wear your clothes be you, hate on you friend. Get my point. Tina was like get the F out of here boy with that water. I'm looking at the playback to make sure my check stay right! I don't know what kind of mothers you cynical jerks have, but most of us know our mothers have our best interest at heart. You need therapy. I respect her hustle. She is the hardest working woman out there. The connection and passion she has for her work shines through soooo brightly.. To me, she is on the Michael Jackson level. I wish nothing but the best for her and her family. Love the documentary. Will be getting her CD.. She on top of her game for sure. Say what you want, give her credit where it's due, She's FIERCE..
No one is saying that she is the only hard working person out here! I see it as her speaking for herself and other's like her, especially women, who are strong and independent. She's not trying to down anyone or say that she is better than anyone. She wants to inspire others to follow their dreams and reach for the stars. In other words, I think she is speaking for every person out here who are independent and hard working. She has a voice and the ability to literally show people what independence is whereas a lot of us don't have that ability. I think she's very inspirational and it's nice to know that she works just as hard as most of us do!